Ashley får PETA's Kind Choice Award! 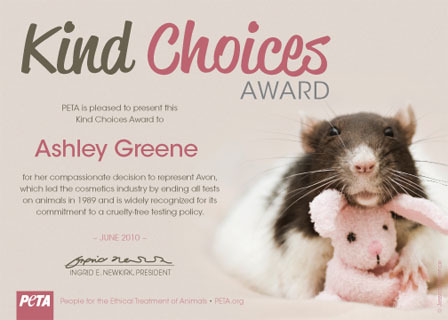 “For choosing to partner with cruelty-free cosmetics company Avon, Ashley Greene has earned a Kind Choices Award from PETA. Greene will receive a framed certificate and a card signed by PETA staffers. Greene isn’t the only Twilight star to stick up for animals. Kellan Lutz and Christian Serratos have both teamed up with PETA to fight animal abuse. Greene is the new face of mark, Avon’s youth-oriented brand. Avon was the first major cosmetics company to adopt a cruelty-free policy—the company ended all animal testing of its products and ingredients in 1989, years before many Twilight fans were born. Over the years, Avon has received PETA awards for its cutting-edge, cruelty-free policies governing not only its cosmetics but also the Avon Foundation’s work against breast cancer.